The Christmas tree Lighting Ceremony was held in Charlestown on December 02, 2015, under the patronage of Stephen Hanley. He turned on the switch to the Christmas tree at the Memorial Square, to herald in the start of the festive season on Nevis. 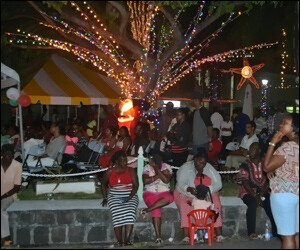 The event which is the largest of the 26 tree lighting ceremony to be held throughout the island this year, was organized by the Community Development Department in the Ministry of Social Development on Nevis. According to the Department, Hanley was this year’s honoree based on his sterling contributions to the community, in particular his efforts through the Nevis Cadets Corps and a teacher. In response, Hanley thanked the Nevis Island Administration and the Department for the honor. He said it was a humbling experience for him to be selected as patron for the Christmas Tree Lighting Ceremony.